Sign up to become a Next Generation member today, and receive an autographed photo of Lt. Col Allen B. West as your free gift! By becoming a member, you’ll stay up to date on the current events affecting our nation’s future. You’ll also be supporting Allen West as he stands up for America’s next generation. Memberships begin at just $5 per month. Or you can choose to save money with our discounted annual memberships. Either way, you’ll gain access to all of our Next Generation TV shows, including episodes of “Next Generation Today,” commentary videos from Lt. Col. Allen B. West, and new shows that are coming down the pike. Plus, you’ll be able to watch all of the informative and entertaining PJTV shows. Click here to explore the many benefits our Next Generation memberships, and choose the one that’s right for you. But hurry! This special offer is only available for a limited time. 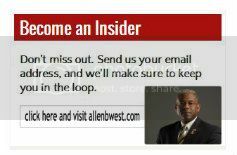 Become a member and claim your autographed photo of Allen West today! This entry was posted in Next Generation TV and tagged Allen B West, AllenWest, Barack Obama, Chad, PJTV, Television, Television program, United State. Bookmark the permalink. Allen West “I waited to see if I was dreaming and not falling prey to silly April Fool’s prank. Today Obama announced ..